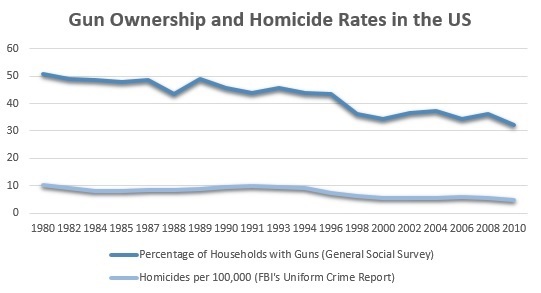 Gun ownership rates have been falling over the past few decades. Fewer and fewer people are choosing to risk keeping a firearm at home. In fact, America is losing about a million gun owners every three years. What has happened to the homicide rate during the same time period? Of course, gun ownership is not the only factor which affects homicide so you would not expect to see a perfect correlation between these two variables. Nevertheless, there has also been a significant decrease in the homicide rate as can be seen from the chart above.